Within the serious games literature, attention is mostly focused on the benefits of playing games for students. In this chapter, we attempt to demonstrate the benefits of working with students to design and produce games for use in sociology teaching. We show how a playful approach/environment, which engages students and assigns them an active role in the gamification process, can be mobilized to facilitate student game design and the production of game resources that have pedagogic value and impact. We suggest that this approach generates a range of benefits for the students involved and the games produced. Hand, B. (2016). Designing Successful Gamification in Higher Education. Available at http://www.gettingsmart.com/2014/02/gamification-successes-and-failures-higher-education/. HEA. (2017). HEA Starter Tools: Gamification and Games-Based Learning. Available at https://www.heacademy.ac.uk/enhancement/starter-tools/gamification-and-games-based-learning. Accessed May 30, 2018. Neary, M. (2012). Teaching Politically: Policy, Pedagogy and the New European University. Journal for Critical Education Policy Studies, 10(2), 233–257. Available at http://studentasproducer.lincoln.ac.uk/files/2014/03/10-2-08.pdf. Accessed May 30, 2018. Whitton, N. (2015). Beyond Gamification: Play in Higher Education. In N. Jackson, C. Nerantzi, & A. James (Eds. 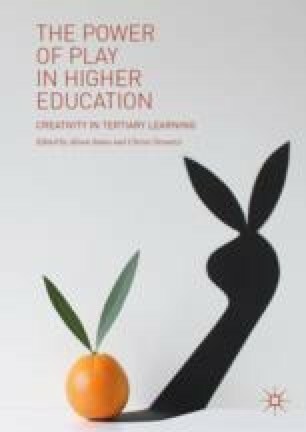 ), Exploring Play in Higher Education, Creative Academic Magazine (Issue 2). www.creativeacademic.uk.